I’ve finally found thirty nano-seconds to write a blog post during the first week of the Easter school break. Even the Wildwood is saying there’s an injustice done, somewhere! Ha! I suspect, it’ll be to me, being Pisces. I’m not sure whom, over the next two weeks, will be crying “It’s an injustice!” The eldest two, or me. 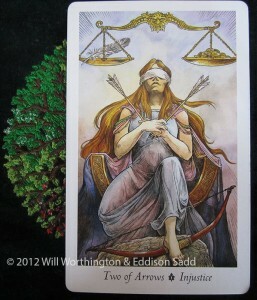 But the Two of Arrows (Swords, if you like) isn’t all about having the injustice done to you. It could also be done by you, by not having the information or not paying attention to things. Over the next two weeks, there are bound to be things that I don’t see, that the kids don’t see. Are they important? I hope that whatever I missed, is not important. I hope that whatever the little darlings get up to, isn’t too dangerous or too restricting for them. The biggest thing I find with the Two of Arrows, is not cutting your nose off to spite your face. An old Scottish saying, I think, that means doing something to detriment yourself where you really don’t need to. There are others around who will do that for you, certainly, so why bring yourself down? I am certainly enjoying the more relaxed morning get ups though. It’s nice to not have to run things to a military regime just to get the eldest two to school on time, with all their necessary kit. It’s exhausting for them, and for me. So during the Easter / Ostara break, be careful of the injustice that we cause or suffer from. Be careful of acting on information that isn’t complete and going off, half cocked. I’m good at that, so I hope I curb it during these two weeks! Thanks for dropping by, for taking the time to read my blog entries. I’ve used the Wildwood Tarot, as usual. If you’d like your own private reading, you can book it here.